how to get there and how to find your way around. Easy to navigate and interactive Cape Peninsula and Cape Town maps with directions on how to get to the sightseeing highlights of the City, the Peninsula and the Table Mountain National Park. The Cape Peninsula is a narrow stretch of land, that has the form of a finger when you look it up on a map. Cape Town is situated in the north of the Cape Peninsula, which is home to the Table Mountain National Park. Starting from Table Mountain which is situated inside the City’s limits, the Park extends southward all the way down the Peninsula to Cape Point. Its location makes Cape Town the perfect base from where to explore the region. The largest airport in South Africa is OR Tambo International Airport in Johannesburg, with Cape Town International Airport following as the second largest. 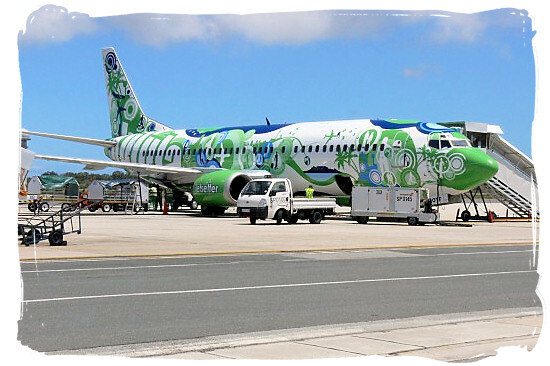 On a national basis there are many daily flights to and from the major cities of South Africa to Cape Town. Internationally, many of the major airlines offer flights from all over the world straight to Cape Town. By the way, pick up services (from the airport) are provided by nearly all hotels, guest houses and so on. BY CAR Almost all the national roads to and around Cape Town are in pretty good shape. So the use of a car a very good option, if you have the time. The many sightseeing opportunities you will pass along the way and the self-drive freedom, will make it a fantastic experience. Compared to Europe and many other countries, hiring a car is quite cheap. The same goes for fuel, which is really cheap, compared to Europe. 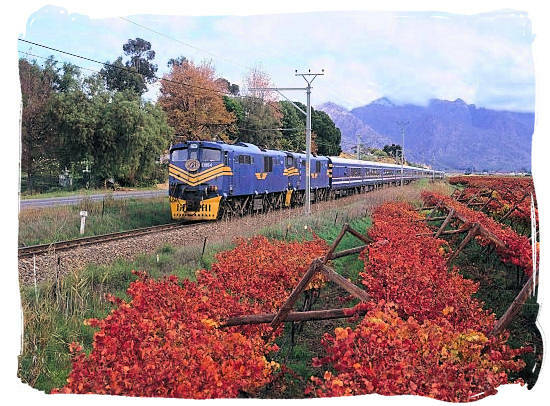 South Africa has an excellent inter-city passenger train service, which is operated by PRASA, the Passenger Rail Agency of South Africa. It has two divisions, Shosholoza meyl operating the inter-city trains and MetroRail operating the commuter trains in and around the major cities. The main train station of Cape Town is situated on the corner Strand street and Adderley street in the city centre. All trains to and from the major cities of South Africa depart and arrive at this station. The inter-city trains have three classes, the economy class providing seating only (no bunk beds), the tourist class providing seating and bunk beds for overnight trips (bring or hire bedding) and the luxurious premier class providing seating, beds and bedding and all meals. Economy and tourist class trains have a buffet car for food. All major bus companies provide comfortable transport between Cape Town and the major cities of South Africa. You may find up to 6 buses a day to and from certain cities. Starting point is the main bus station which is conveniently situated next to the train station at the corner of Strand street and Adderley street close to the Golden Acre shopping centre. Sometimes it may be a problem to find the departure point of your bus. So it might be a good idea to first check with a nearby tourist information centre or with reception at your hotel with regards to departure points, departure times and connections. Getting around by foot is an option, provided you are staying within reasonable walking distance of your destination. But keep in mind that on the whole, distances are long here and that public transport facilities in Cape Town (and in South Africa in general) are not very good. So in the end you will soon find it frustrating not to have your own transport. There are plenty of car hire companies to be found at the airport and throughout Cape Town and the Peninsula. Please be aware that in South Africa you can't pay for fuel with a credit card, it has to be either cash or a "Garage card" issued by a South African bank. Cape Town also offers several luxury chauffeur services, providing a variety of services such as airport transfers, transportation to corporate and business events and also VIP bodyguards. 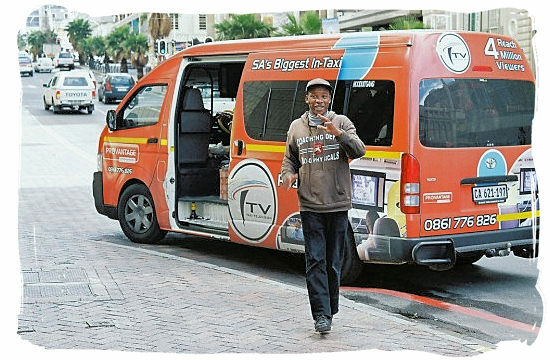 One of the most common and popular means of transport in South Africa are Minibus Taxis. They are widely used by the local South Africans, because they are cheap and will get you everywhere you want. However, there are a few drawbacks. Because of overcrowding and often dangerous driver behaviour they are less safe than the metered taxis. For those reasons tourists are often discouraged from using them, except for certain specified touristic routes and regions such as Green Point, Sea Point, Clifton and the Camps Bay route for instance. Good news is that a number of minibus taxi operators have recognized the value and also the needs of the tourism market, providing legal and safe alternatives to the traditional minibus taxis. Somewhat more expensive, but still far cheaper than the traditional meter taxis. The traditional meter taxis are quite reliable and safe. The City Council keeps a strong eye on them by means of safety regulations, pricing and standard of service. The price per kilometre is often displayed near the Taxi’s side door. You can also negotiate with the driver, especially when you want to travel a longer distance. You can then set a fixed fare with him. Going to the airport is an example. It is about 21 km from the city center and you can often bargain down the fare to a very reasonable level. 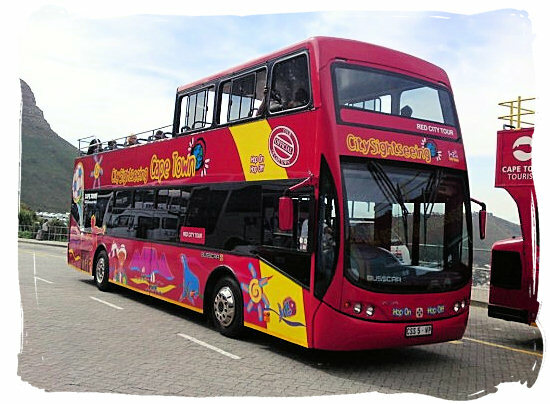 You will find there's a network of public busses in and around the cape that provide inexpensive transport for example from the city centre to the Waterfront. You should ask the driver where the bus is going, to make sure you won’t end up somewhere else. They run mostly during the day and again, they are often crowded, dirty and not always comfortable. Still, they are safe and inexpensive and it can be fun if you do not mind a few small drawbacks. You can also hire a scooter or a small motorbike. A number of places in the city offer this service and it is a great way of being mobile and much cheaper than hiring a car. As far as a bicycle is concerned, unless of course you enjoy the soreness of biking up and down mountains while dodging city traffic on narrow streets, it is not the ideal way to get you around the Peninsula if you are not used to it. 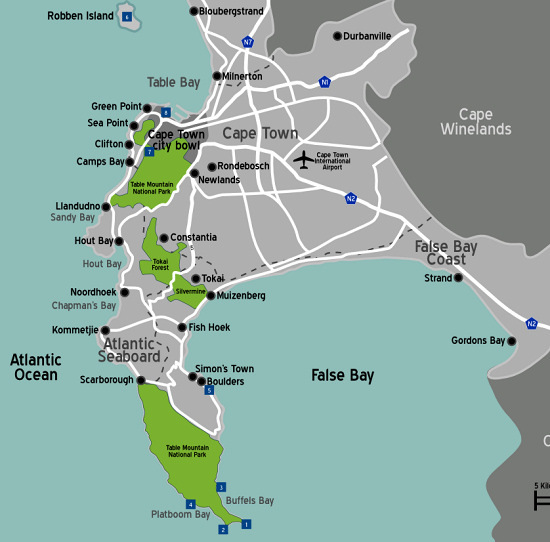 The following are a number of easy to navigate interactive maps with routes and directions to some of the major tourist attractions on the Cape Peninsula. The button in the left-hand top corner allows you to select a larger version of the map and a route description. A tranquil journey featuring sights and sounds from the V and A Waterfront Cape Town, Cape Peninsula and Cape Point. A tour to the national botanical garden, Kirstenbosch and the historical wine estate, Groot Constantia, finally ending up on the top of Table Mountain.